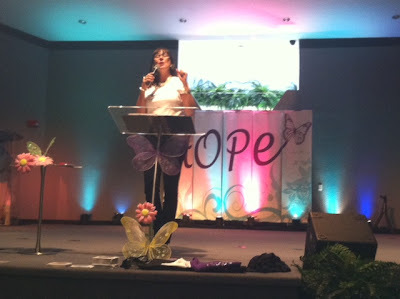 Some women in Miami got fresh hope this weekend. Here's Tammy (our amazing emcee) as she was introducing something or someone -- I snapped this photo on my iphone. It's not the greatest photo but it's what I've got...there was a professional photographer there and I'm hoping to snag a few of their photos that I'll post later. It was a fantastic weekend but I am just so exhausted right now when I'm writing this (as 12:30 am after getting home) and need to crash before having to get up this morning for church. We have a full morning at Celebration and then our friends Pastors Russ and Betty Jones, Pastors of Faith Family Worship Center in Palm City are coming to spend the night at our house tonight and be with us tomorrow for the holiday. It's going to be a really good time but I need to get some sleep so I'll actually be half way alert to enjoy it. I am so thankful for all that God did on this Hope Tour stop. One lady who had been struggling with deep depression and was set free at the altar flung her arms around me and said, 'THIS HAS ABSOLUTELY SAVED MY LIFE!!!" There was such an anointing yesterday for healing and much more...I can 't wait for four more weeks when we hit the road for Jacksonville and do it all again! C'mon, Jesus!!! Deanne, you did saved my life because the Holy Spirit spoke to me when you asked for healing. My life has change. Some people talk, walk, work, take care of family just because is what we do, but I was dead and now I AM a living proof of a miracle. Thank you so much for allowing the anointing one to give life again. May our Heavenly Father continue to used you to save more lives.